China's southwestern Guangxi Zhuang Autonomous Region has been attracting private funding to finance its highway construction. The measure has helped the budget-short local government speed up the expansion of its highway network in the mountainous region. 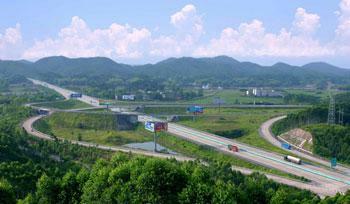 High speed motorways are of great importance to the development of the Guangxi Zhuang Autonomous Region. The mountainous area depends heavily on highways for transportation and communication with other parts of the country as well as bordering southeast Asian neighbors. The region is now building 14 highways with a combined length of around 15-hundred kilometers. Such scale of construction is not something the cash-strapped local government can afford. Authorities have decided to break its monopoly on the road construction business. Li Xiaolin, chief engineer of Transport Dept., Guangxi Zhuang Autonomous Region, says, "it's not good for the government to invest, construct and manage the highways all by itself. We had to introduce other players." The regional government allowed the establishment of two transportation construction companies to participate in the investment of highway projects. Wei Yongqiu, MD, Guangxi Transportation Investment Group, says, "we use highways as a resource to attract investors and cooperators, so all kinds of social funding can help us build highways." China allows road investors to collect tolls as their pay-back. Guangxi has transferred the toll collection rights of 11 highways worth tens of billions of yuan in return for the investment. Earlier this year, 6 commercial banks also decided to participate in the business and provided 55 billion yuan for road construction. This has been an immense help for the 14 new highways in the region that received sufficient funding and started construction this year.